We are offering Braided Manlid PTFE Seal to our client. Under the assistance of talented professionals, we are manufacturing Mechanical Seal with the international quality standards in various shapes, sizes and patterns. This product is specially designed to prevent oil leakage in machines. Our assortment is quality tested on various parameters in order to provide end to end solutions to the clients. - Used to prevent from leakage. Scope of supply : We offer a very wide range of mechanical seals like PTFE Bellow seals, Rubber Bellow Seals, Metallic Bellow Seals, Single spring, Conical spring and Multispring seals suitable for varied applications. The PTFE Mechanical Seal for Acid Pumps offered by us is used in applications involving the use of chemicals. 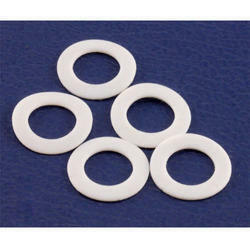 We are offering a large array of PTFE Spring Seal to our valued customers. In order to fulfill the ever-evolving demands of our esteemed clients, we are engaged in providing an optimum quality array of PTFE Lip Seal. With a firm commitment to quality, we are involved in offering a wide ambit of PTFE Seals. Our firm is a well-established name in this business and is involved in offering a supreme quality range of PTFE Mechanical Seal to our customers. These products can be availed in different specifications with us.